This year, I went to four different dance recitals, and one dress rehearsal. It was fun to see the differences between how each studio ran their show. They were all very enjoyable to watch, and they all did things a bit different. The first two recitals I went to were put on by Lake Area Dance Center. You can find my complete write up of the recitals here. The first show was the Competitive Gala. It was all the solos, trios, small groups, and large groups that competed. It was a long show at 3+ hours, but so worth it! We have some very talented dancers and choreographers that made every minute worth watching. The second show I saw most of was a combination of competition large and small groups, and recreational groups. It was my son’s first ever dance recital, and my daughter’s 9th. I was so proud of both of them! At Lake Area Dance, there is a radio-style announcer that introduces numbers and helps tie the theme of the show together (often while the curtain was closed to get preschoolers or props staged). This year, the theme was “Live, Love, Dance”. Most of the dances were somehow tied to different seasons of love (crush, love of a parent, love of a child, breakups, etc). The announcements were in the style of “The Dating Game,” i.e. “You’ll fall in love with this group…” It reminded me of the scene in Shrek where the magic mirror is introducing the different princesses to Lord Farquaad. There was some humor mixed in. It was very entertaining. 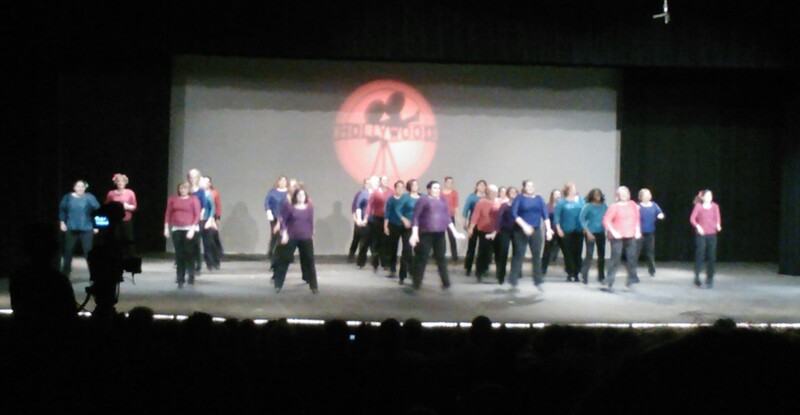 The moms rock the stage at Arabesque’s recital. While people were shuffling in, finding their seats, etc, they had solos and duets entertaining the audience. I have to say, I am impressed that all that commotion didn’t throw off the dancers. None of the solos/duets/trios were in the show itself, so this was a great way to still let them show off their hard work! I wish I’d have known about it, because we got there shortly before the show started. We would have enjoyed seeing more of said solos. The show lasted close to 3 hours. One thing that I really like about Arabesque, is their presence of boys. They have several boys that appeared many times through their show. The boys are really nice too, we’ve seen them at competitions. In particular, there’s one boy, Logan, that I really enjoy watching. That boy is going to be a star – he has a HUGE personality that reminds me a bit of So You Think You Can Dance winner Benji Schwimmer. They had wonderful lyrical routines! My favorite was one where each of the teen girls was a different “princess”, though not how you’d think. I don’t think I can even do justice to how cool it was – they each had a prop to symbolize their princess, their costume colors matched the princess’s costume… it was beautifully danced. Two thumbs up to the choreographer! I also enjoyed watching their tap dances. They were very hard hitting, and together. Even from the back of the auditorium, you could feel the beat of the taps on the floor. I had to laugh a little when their Yankee Doodle tap dance came on; Grace looked at me, and said, “Mom, this was the dance that beat our tap dance!” Yep, they were the ones that got third place at StarQuest, when Grace’s dances took 1,2,4. I really don’t think they missed a beat! The transition between dances was smooth. Dancers came on the stage, and dancers went off the stage… there wasn’t anything to “tide the audience over” while props or preschoolers were being set up behind the curtain. In fact, I’m not even sure there was a curtain closed in between. I honestly can’t remember that detail off-hand, but I do remember Prop Dads being cheered on while setting up the props. My little preschooler I went to watch was so cute! I was glad to have the opportunity to watch her perform in two dances at the show (and see her one last time before she goes off to Kindergarten)! 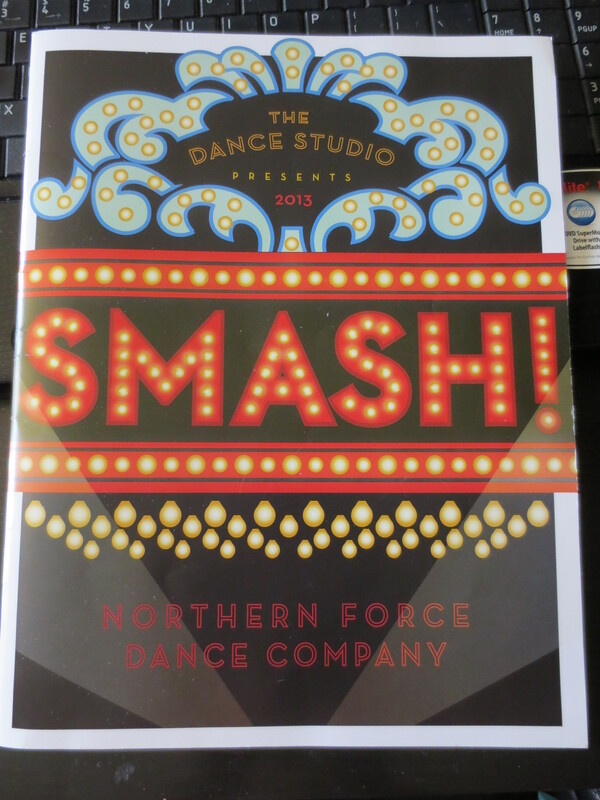 The last recital I went to was for The Dance Studio, home of the Northern Force Dance Company. I first saw this studio while watching the Hall of Fame competition live online last year. Their dance to Turning Tables had me in awe, and is still in my top favorite 5 dances of all time. I was disappointed to find out we wouldn’t be at any of the same competitions as Northern Force this year from another one of my preschoolers, who dances for their youngest competition line. I couldn’t pass up going to their show! At $18/ticket, it was a bit expensive to take both my kids to, and at over 3 hours, my 7 year old son struggled to sit through it. For Grace (12) and I, it could have been longer, and we still would have loved it! It was worth every dollar! My preschooler’s grandma was running the ticket booth, and was nice enough to buy a program for me! That was very helpful! Their program was very similar to Lake Area’s, with pictures of all groups featured inside. In the center of the program, was a list of all the dances, and which shows they were performing in. It did not appear they had a printout that people could pick up that had the order of the dances. For the record, both Lake Area and Arabesque had the printed version anyone could get. This one may have, but I didn’t see it (and it really didn’t matter to me, since I had the program). What was cool too, was that one of my preschoolers from the year before, now in Kindergarten, was in the show too. She was super excited to see me there, and I was just as excited to see her. She was one that gave me many funny stories, and kept me laughing the year before! I think it was probably the best recital I have ever been to. They have so many competitive groups, that it felt like being at a competition, only without the judges! 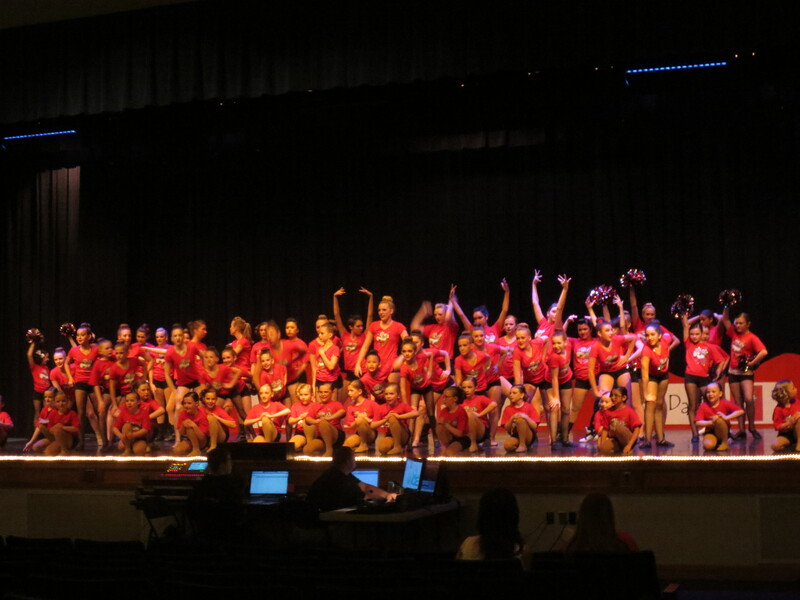 Of course, they had the typical Opening number featuring many of their competition groups. Their show theme was Smash. Most of the show was done in sort of a collection of show/movie themes. There was a huge screen behind the dancers, onto which several different pictures were projected. One example would be that when the little kids were doing some Disney songs, the castle from Disneyland was projected behind them. One of the itty bitty little boys had obviously not noticed this during rehearsal, and turned around, walked up to it, and was touching the picture behind him. It was so cute, and so funny! One thing Northern Force does well, is their use of props. They had girls tapping up and down stairs (that dance made an aerobic step class look like a piece of cake). They had girls dancing on blocks that were moving across the stage, and girls dancing around the mast of a beached sailboat. They also tended to use each other’s bodies as props. As weird as that sounds, there was one dance, I thought they were all sitting on a block of some sort, but as they kept dancing, there was nothing there. They were propping each other up. Their use of each other’s bodies were amazing! 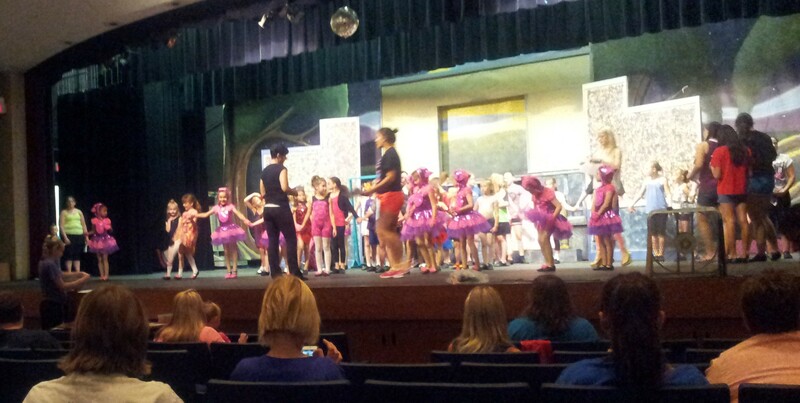 I just found out early last week, that my niece was going to be in her very first dance recital. At one point, she wasn’t going to be able to be in the show, but they were able to work it out so she could go. Unfortunately, the shows were Thursday night, when Michael and I both started summer dance, and Friday night, when the three of us were in a local parade with Lake Area Dance. Since I couldn’t make it to her recital, I went to watch her at her dress rehearsal (and brought her a rose, because every little girl wants flowers at their recital). I loved the theme of their recital, “Things That BOOGIE in the Nite.” Their show was broken into 3 acts, the first was all the younger children, and included the finale. Then, there were the other 2 acts which included all the older girls. There was a huge backdrop painted by the owner’s nephew, and a giant prop (made to look like the inside of a mansion) that served as the backdrop for Act 1 (which my niece was in). In between Act 1 and 2, they removed the mansion room. It was kind of fun watching my “little” brother playing the role of Prop Dad in between acts! My brother’s girlfriend dances, and is a teacher at this center, so I only stayed to watch them rehearse Act 2 (which she was in), until her tap dance. They danced to “Troublemaker“, it looked like a lot of fun. I would have loved to be up on that stage with them! The story behind Act 1, was that the teacher/owner was going to have a home and garden magazine come do a photo shoot inside her mansion, and she needed to clean it up before they came. Each of the dances represented different things she was “cleaning up” (“Itsy Bitsy Spider“, “Casper the Friendly Ghost“, devils in “Hot, Hot, Hot“, etc). Julianne did a duet with two of her daughters (who were her “Magic Mirrors”). I loved it – it was a great dance!! It’s always interesting to see the processes that different studios take both behind the scenes, and during their shows. This one used the teacher telling the story to tie together the show, and buy time for groups to get on and off stage. At least at dress rehearsal, they didn’t have the curtains close even once that I can recall. I would have loved to have been able to see the final product, but glad I got to watch what I did. 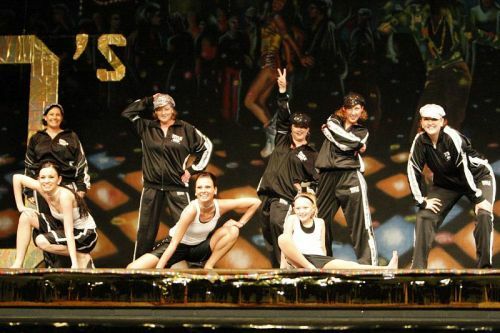 Adult Hip Hop group from the 2012 recital. Grace was in this dance with us. When we lived in WI, Grace attended Eau Claire School of Dance (ECSOD) for 5 years, I danced there for 4. We were not able to go to their recital this year, because it was on the same weekend as ours. I did feel it was worth mentioning how they do their recitals though, as they had another, slightly different, approach to that in between time while dancers get on and off stage. The curtain closes between most of their dances, and various groups of Company Dancers (their competitive groups) come out and do little skits in between that tie the theme of the show together. Think of mini-commercials, only not really advertising anything. They also do their finale a bit different than most studios I have been to. Where most shows I have been to have a choreographed finale that all the dancers do together, ECSOD invites whatever dancers want to come back on stage for the finale to come on and just dance. It’s a lot of fun, as we would dance however we wanted for the last song, took a big bow, and the curtain closed. Their shows have always been high quality, and quite enjoyable as well. I am looking forward to being able to attend another one of their shows in the future!